They say that tall oaks from little acorns grow. 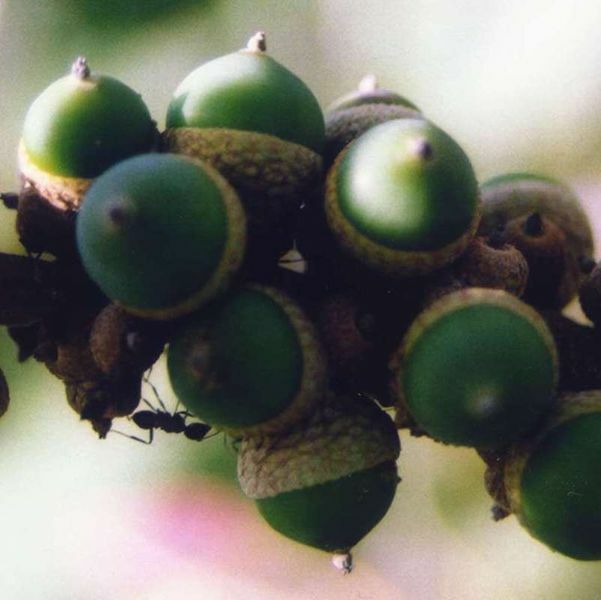 Judging from this year’s acorn supply, the region will be well-forested in the future. Oaks occasionally generate bountiful acorn crops – and many years, produce not a nut. Last spring apparently offered ideal conditions for pollinating oak flowers – dry, warm weather. Of course, most of this year’s bumper crop will be consumed – by nearly 100 kinds of birds and mammals. For creatures as small as a nuthatch or a mouse and as large as a bear and a deer, acorns are a major source of food in the fall. The ebb and flow of populations of such common creatures as Gray Squirrels and Blue Jays are closely related to acorn yields. With so many fans in nature, you’d think humans would be acorn-eaters, too. In fact, they once were: American Indians and early settlers ate acorns. Today, however, we’ve been spoiled by the sweeter meats of peanuts, cashews, almonds, and other nuts that are also easier to process – and to salt.